Objective: The purpose of the study was to review 102 consecutive robotic-assisted laparoscopic colectomies at our institution. 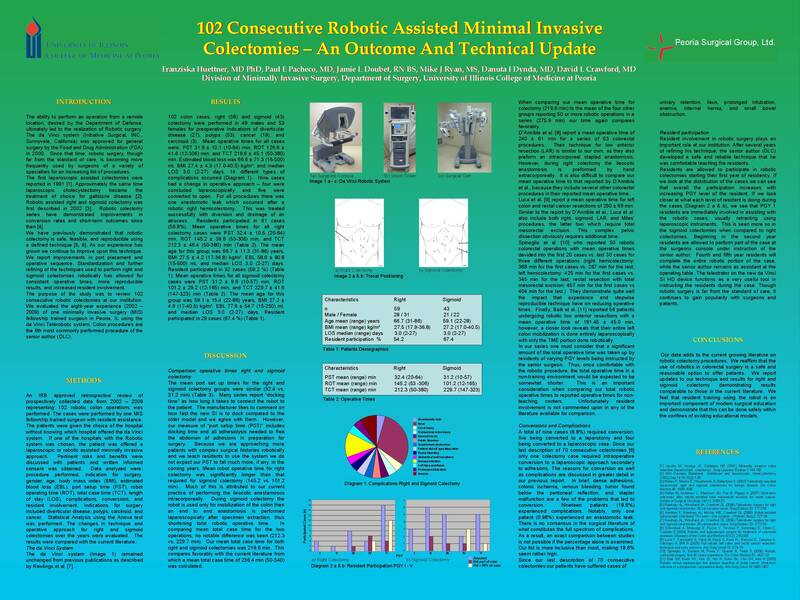 We evaluated the eight-year experience (2002–2009) of one minimally invasive surgery (MIS) fellowship trained surgeon using the da Vinci Telerobotic system. Colon procedures are 6th most commonly performed procedure of the senior author annually. Methods: An IRB approved retrospective review of prospectively collected data from 2002–2009 representing 102 colon operations was performed. Data analyzed were: procedure performed; indication for surgery; gender; age; body mass index (BMI); estimated blood loss (EBL); port setup time (PST); robot operating time (ROT); total case time (TCT); length of stay (LOS); complications; conversions; and resident involvement. Statistical Analysis using the Anova test was performed. The changes in technique and operative approach for right and sigmoid colectomy over the years were evaluated. The results were compared with the current literature. Results: One-hundred and two robotic colectomies, right (59) and sigmoid (43), were performed in 49 males and 53 females. Average patient age was 63.5 + 13.6 (22-86) years. Mean BMI was 27.4 + 4.3 (17.0-40.5) kg/m². Preoperative indications included: polyps (53); diverticular disease (27); cancer (19); and carcinoid (3). Mean total operative time for all cases was 219.6 ± 45.1 (50-380) min, with a mean robot time of 126.6 + 41.6 (12-306) min. Operative times for right colectomies were: PST 32.4 ± 10.5 (20-64) min; ROT 145.2 ± 39.6 (53-306) min; and TCT 212.3 ± 46.4 (50-380) min. Times for sigmoid colectomies were: PST 31.2 ± 9.6 (10-57) min; ROT 101.2 ± 29.2 (12-165) min; and TCT 229.7 ± 41.6 (147-323) min. Mean EBL for right colectomies was 58.6 + 80.8 (15-500) ml and 77.6 + 54.7 (15-250) ml for left colectomies. Overall median length of stay for all patients was 3 days with a range of 2 to 27 days. Complications occurred in 19 patients with an overall complication rate of 18.6%. Nine cases were converted – four to laparoscopic and five to open for a total conversion rate of 8.8%. Anastomotic leak occurred in one patient (0.98%). Residents PGY levels 1-5 participated in 61 cases (59.8%). Conclusion: We demonstrate with this series that robotic colectomy is safe and feasible. Procedural sequence and technical alterations have been made that have improved efficiency. Senior author experience has allowed resident participation to evolve to the level of primary surgeon in both procedures. Our results compare favorably with other series in the robotic literature. Resident participation is critical if we hope to bring robotic procedures into the mainstream of surgical practice.